Another Woman's Top 50 Games: The 8s are Gonna Kill Me! It seems that we're all doing these now, so after ten real years in the hobby (and many more as a casual gamer), I guess it's my turn! I managed to keep my list to 50 but only by pruning out a number of games I really like... Garden Dice, Disaster Looms!, Zpocalypse, Edo, Rialto, The Speicherstadt, Runebound: Mists of Zanaga, Drum Roll, VivaJava: The Coffee Game... see, I just can't even look at our game shelves without realizing dozens of games that I love and have left out! My lone "10", there's not even much to say about it. After TtR, this is the game that brought me to "Euros". It's really hard to proclaim a favorite Feld, but this might be it. As with his other games, the balance is in the zone for me... hard and strategic without punishing a from-the-gut player like me too much... and allowing for subtle strategies to build while nobody's paying attention to one aspect of the multiple factors going on in this game. This is a game of great relief after hard-core, tense strategy games. Rewarding those who seem to be giving the game away, the kids often win and the third bean field's rarely worth it. A solid 9 and I can't imagine this one losing its place in my line-up. I love the rhythm of this game. I love games that require you to spend every nickel every turn, rewarding the boldest risk-takers with bigger spoils down the road (just don't start out with the theater...) The noble collecting is a challenge and I do love how people can win with different strategies in this game, making the outcome an uncertain thing until the very end. 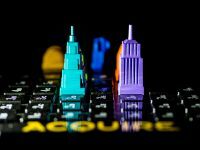 Luck is involved in the availability of the cards, and while that drives some spreadsheet-types crazy, I like the randomizing element which keeps it from being a sheer exercise of mathematics. 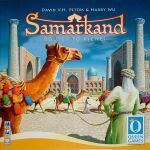 This game really fueled the fire of loving games with camels in them... but this is clearly my favorite of all those games. Set collection, scarce resources, somewhat complicated scoring which makes the eventual winner not a given or even known thing until the end... it's got it all. It requires some cooperation but mostly the player interactions are about advancing your family even if it helps someone else, not because it does. Components are attractive and our set has held up to many, many plays. Poverty cubes. What more do you need to say? 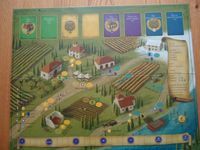 This game is rich and complex and interesting; the theme is slightly pasted on but the cards are excellent and the components are all beautiful. This doesn't hit the table often enough IMO. This one hits the table way more often than average too, and it's one of the few games we have that I think we almost never play without the expansion. I love the multiple paths to victory, I like that you can play it serious or silly, and I like the levels of player interaction. Set collection can be a sneaky path to victory here and I like that the winner's not clear until the very end. I just cannot explain why this game hits such a sweet spot for me, but it does, and I will never turn it down. I like the planning, the level of luck with the dice, and love the physical components. Another "9". How to choose a favorite TtR when you have them all? I like some of the rules changes that were made to tighten the game up for 2-3 players, and this is probably my favorite set overall. As with many of us, this was among my first "Euro" games and I still use it as a gateway for folks ready for harder games. It never disappoints! Only the 1999 edition will do... the modern ones are especially bad and Hasbro should be ashamed. We own the original 3M Bookshelf version too, which is only slightly less fun to play. I like building a village and enjoy the different roles. Stickering this game nearly drove me down to an OCD-level meltdown, but I have forgiven TMG for making the wooden parts non-symmetrical. It looks so lightweight, with its candy-wood pieces, but this is actually a serious game that will whup you if you assume it's fluff. We've replayed this so many times and never tire of it. Love the windmill mechanic. I seem to be the lucky queen of getting to squat on some spaces for a long time, making tons of money in the process when everyone else is afraid of squatting and losing money. I am also evil about redecorating a casino at exactly the right moment. I claim to not be a cutthroat player, but this game brings out the serious competitor and naked greed in me. I don't always win, but I do always enjoy the challenge. This one is a bit of a surprise to me; I am not sure how I could give it a 9 with all the fighting, and I'm not sure how I could give it less than a 9 with the depth that I enjoy in this game. I think this game arrives at its position mostly through the intriguing rondel mechanism and the way you choose/take tiles. 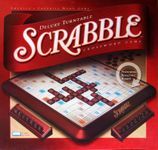 If I confessed how many Scrabble sets of all flavors that we own, you'd probably think that I need professional help, so I won't tell you. I met my second husband playing Scrabble online and we continue to play very competitively. 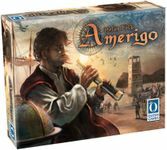 A solid 8.5 that may well grow on me, Amerigo has a great mechanic or two and huge replayability when the three mini-expansions are rolled in. A classic Feld in the making! The fighting is not my favorite part, but since it's not the whole game by any means, I don't have a problem with it. I love the discovery/settlement/colonization process and the technology tracks. I'm glad to form alliances with my neighbors and usually choose not to fight; I don't always win but I don't automatically lose, either, and it's not a real "turtle" maneuver like it is in some games. I like how meaty this game is and it's endured after many, many plays at our house. 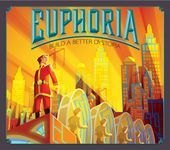 It's not out yet, but being the first non-St. Louis playtesters, and dedicated playtesters of every PnP that Jamey issued, I know this is an awesome game. 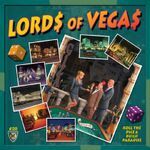 We enjoyed it with cobbled-together components and laminated photocopies... once we have the beautiful components -- and no expense was spared -- this game is going to hit the table all the time. Pretty! Clever! Strategic! Competitive! Involving some mechanics not seen too often in other games (and more often the source of those mechanics than the me-too copier of them), this game seems fresh and different each time you play, especially if you pile in some or a bunch of the varied expansions. I loved Ground Floor right away, even as a PnP. The theme has strong appeal to me, and all the moving parts of this game fit together in a way that makes sense. Just like Power Grid, when you are humming along in this game, you just KNOW you're doing things right... and also like Power Grid, to win, you must take risks and spend all of your resources. Exciting and complex without being a spreadsheet or a brain-burner. 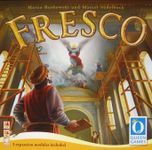 This game is unlike anything else, except slightly, Fresco, but the freshness of the color combos, with the danger of learning something about artists and art :-) make for an excellent game. Sometimes it seems a little dry but I really enjoy it anyway... it's not fighting, it's not grumpy old white guys with ships or mining tools... you get the idea. Different! Despite hating the name of this game, I really like the game play. (There are "queens" too, and I dislike titles that immediately remove half the potential audience... why not Moguls? So many other choices.) The pickup and deliver mechanism's been done before, but not in the same way, and airships are both challenging to maneuver and rewarding when you get it right. The winner's certainly not always obvious, and I appreciate that about this game. This was the very first Kickstarter I ever backed, and remains one of the slowest to be delivered... LOL It was worth the wait and I know TMG learned a lot from this campaign. I learned this game in Taiwan and could easily see why it was a group favorite... it's got some novel mechanics and the components are really gorgeous. I've never mastered it and have lost badly several times but would eagerly play again... given that I can be a very sore loser, that's high praise.